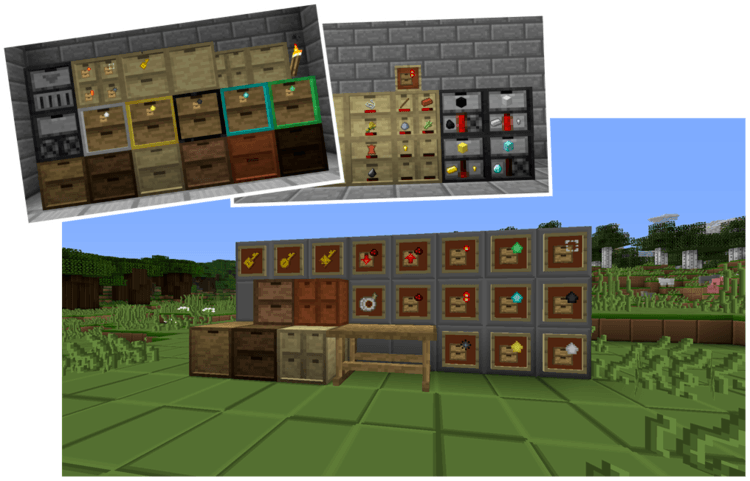 If you want something to help you solve all the problems of storage, Storage Drawers Mod 1.12.2/1.11.2 for Minecraft is the mod for you! You now can contain thousands of similar items in a single block. Due to the fact of Items Storage Drawers to you, you will never worry about storage for any resources. The chest is a highly useful block in Minecraft, which allows you to store items that you do not need now. Therefore, you can retrieve in the next time and use when needed. Its primary purpose is “Archive, ” but when you start with a large variety of identical items as dirt, stones or wood, these available chests will have little features in Minecraft. When you exploit those resources, your chests will be full very fast, faster than you can imagine. If you install additional mods to add new resources, your simple chest will fulfill as soon as you begin to create the world. It is gigantic chest, doesn’t it? Storage Drawers will be a solution to solve all storage problems. The storage mechanism of Storage Drawers is completely different than that of Chest. 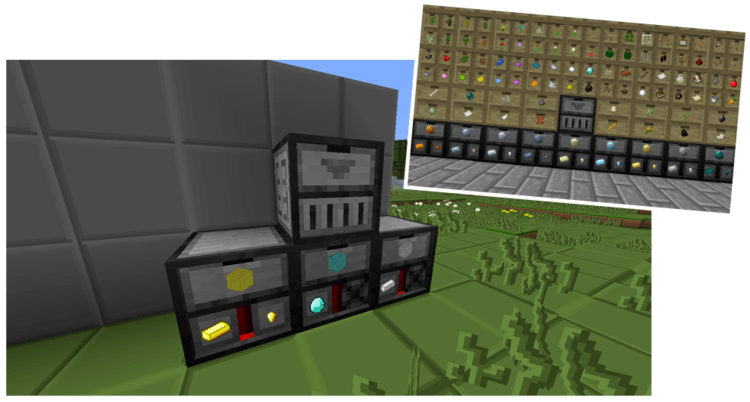 Instead of inventory slots, you have to interact with the chests, which is a minus point of the Storage Drawers system: it cannot contain different types of items in a chest. However, please remember that Storage Drawers are programmed to solve ONE ITEM of yours that occupies too much space of the chest. 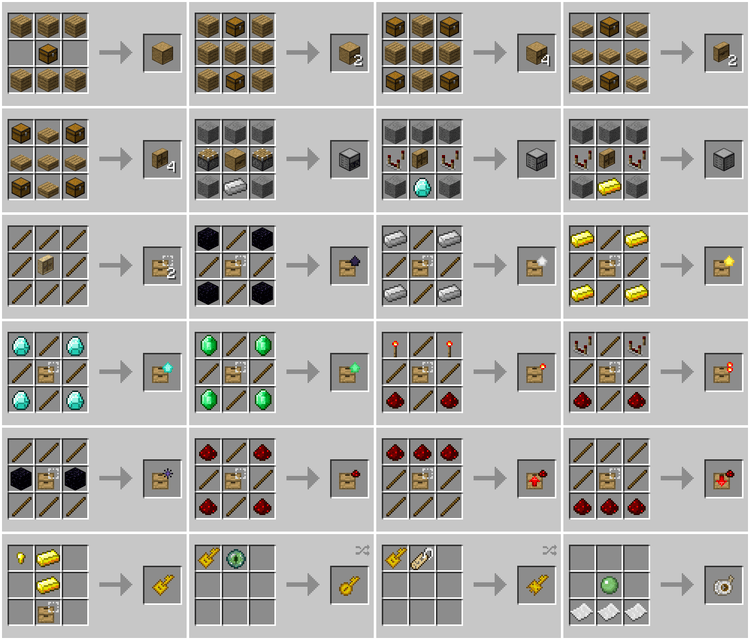 If you contain a resource in a Storage-Drawer, you will see the significant capacity of the block: 1 box of the chest can carry 32 stacks of 1 type of item. It means that one small cavity on a 4-box cabinet has more space than your reliable chest when storing an item! 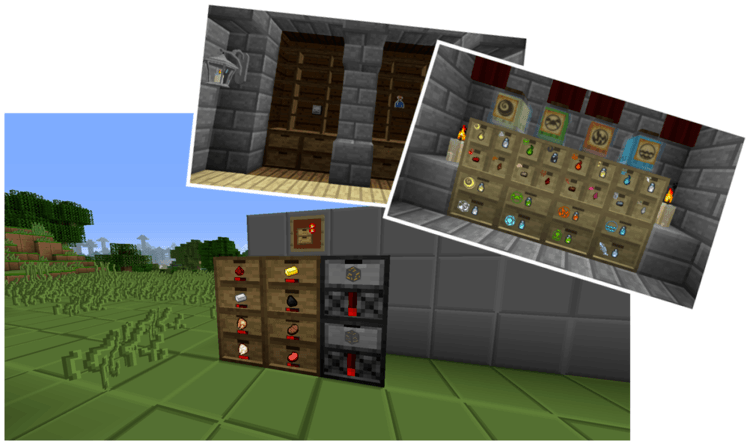 Storage Drawers can now install a new version of Minecraft such as version 1.12.2, 1.9.4, 1.10.2 and 1.11.2. You must install Forge Mod Loader and Chameleon before using Storage Drawers. Download Forge Installer, Chameleon Lib, and Storage-Drawers-Mod.